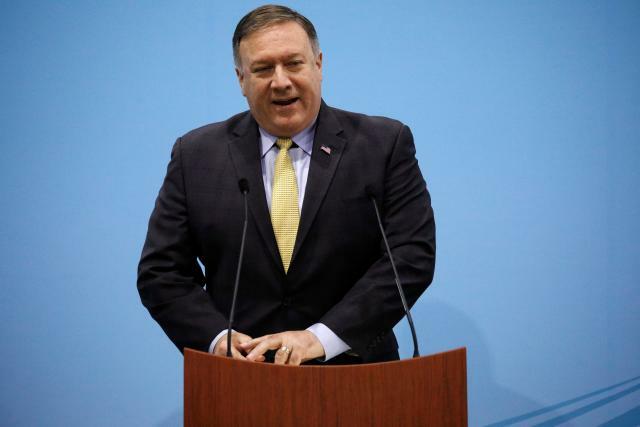 U.S. Secretary of State Mike Pompeo on Sunday played down an exchange of contentious remarks with North Korea on the sidelines of weekend regional meetings in Singapore, saying Pyongyang had made clear its continued commitment to denuclearize. Both Pompeo and North Korean Foreign Minster Ri Yong Ho were in Singapore, less than two months after an unprecedented summit between U.S. President Donald Trump and North Korean leader Kim Jong Un that Trump has hailed as a success despite a lack of concrete action by Pyongyang to abandon its nuclear weapons program. Pompeo and Ri’s interaction nevertheless appeared limited to a brief handshake at the ASEAN Regional Forum. When Pompeo left the meeting on Saturday, Ri delivered an address in which he said Pyongyang was alarmed by U.S. intentions. He also complained about U.S. calls to maintain sanctions on North Korea and reluctance to declare a formal end to the Korean War. Pompeo was asked in a briefing to reporters traveling back with him to Washington whether he was concerned by Ri’s remarks. He noted the tone of the North Korean statement was far different that it was last year. “The minister made very clear of their continued commitment to denuclearize,” Pompeo said. Pompeo stressed the U.S. “mission statement” remained clear. “The U.N. Security Council has said they must end their nuclear program and their ballistic missile program. He has to deliver on the commitments he’s made,” he said, referring to North Korean leader Kim Jong Un. At the June 12 summit, Kim committed in broad terms to work toward denuclearization of the Korean peninsula but North Korea has offered no details on how it might go about this. U.S. officials, including Pompeo, have said North Korea has continued to work on its weapons programs. But he reiterated a call for a phased approach to talks, which differs from the U.S. insistence that North Korea give up its weapons before relief from sanctions. Ri’s later comments were not the first since the summit in which that North Korea has appeared to offer a more negative impression of the progress of talks with the United States shortly after Pompeo has departed from a meeting. Following a trip to Pyongyang in July, Pompeo spoke of progress, but as soon as he had left the country North Korea accused the United States of “gangster-like” diplomacy, casting doubts about the future of the discussions.